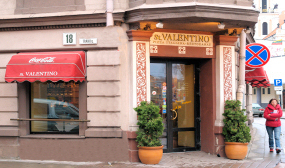 St. Valentino restaurant is bright and welcoming with big windows facing one of the main streets of the Old Town in Vilnius. 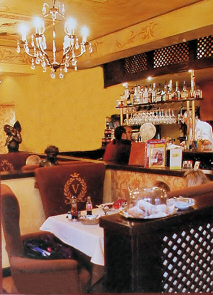 It is classy, yet cosy with candle lit tables, frescoes and statuettes and fresh roses on the tables. White linen cloths and glittering glassware add a note of elegance. They also have an even more intimate area in the downstairs cellars. It is obvious that they really made an effort to create a very relaxing atmosphere - cosy dining compartments with very comfortable plush chairs, most probably the most comfortable chairs I’ve experienced in Vilnius. All the comfort was really appreciated, as I was rather tired after a busy day. Shame about the plasma screen TV on the wall, but I suppose you can't have everything :) I usually find them rather distracting, which I came across in some other restaurants in Vilnius. In this case it was not too bad as they were showing Italian music videos. We chose a table by one of the large windows facing the street, but had we come just about 20 min. later we would have probably waited for a table, as the restaurant was becoming full. We chose a dry white wine at 11 € which went well with our meal. On the menu they also offer lots of fish and seafood dishes. All in all we had a wonderful evening at this Italian restaurant in Vilnius. Delicious food and pretty surroundings inspired a mellow, romantic mood and interesting conversations.